Meeting "The Battle for the Bridge at Arnhem, and the problems experienced with Wireless Communications"
Peter travelled from Ipswich to tell us about his latest historical investigation into Operation Market Garden in and around Arnhem and Nijmegen, Holland in 1944. Peter has travelled to Holland and knew first hand the potential problems facing the Allied Army at that time. However he started off the evening by demonstating a Comtech PLT which is the device typically issued by BT each time anyone signs up to their TV Service over the Internet. He showed it wiped out Radio Reception across the HF band from 500kHz to nearly 30MHz. A brief overview of Operation Market Garden. The Wireless issues suffered in 1944. The trip with Tom, G0SBW and the TV crew in July 2004. Investigation following on from that trip. The 2009 trip in September 2009. What they found operating Wireless over various paths in 2009. Peter has determined that the main reason for poor communications on 2MHz is that this part of Holland is nearly pure sand with a Radio Reflection band some 30metres down - in Salt Water it is mms! A quick trip around Arnhem and the surrounding area, including video of the commemorative Para Drop on Ginkel Heath on 18th September, several wonderful Wireless Museums in the area, a SRS (Surplus Radio Society); Special Event Station at the National Liberation Museum at Groesbeek, and a quick trip down 'Hell's Highway' to get home. Peter told the story very well - "History in the Making" in our time. 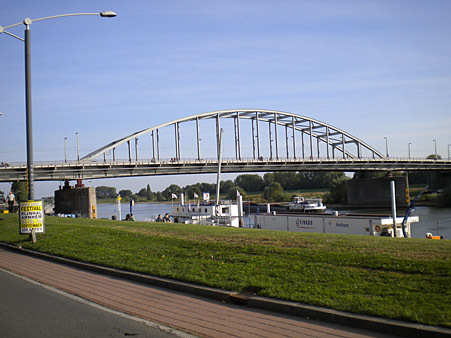 The bridge shown is the one which featured in the famous 1977 film "A Bridge Too Far" at Arnhem, now renamed the "John Frost Brug" after Lt Col John Frost, the Commanding Officer of 2nd Parachute Battalion. Click here for the story of the film. The photograph was taken by Peter in September 2009. The Raffle was drawn and even Peter won a prize. Members and Visitors (thanks to the RAFA) had a very interesting evening. 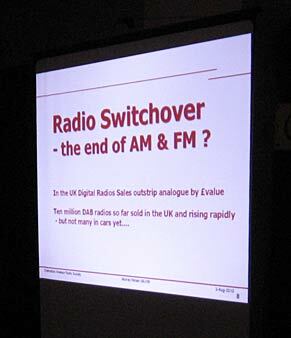 August Meeting - "Digital Radio & TV - What is Next?" Have you switched yet? Think you are ahead the game? In March 2002 Murray G6JYB gave CARS a landmark talk of the then embryonic Freeview and the TV switchover project that many now take for granted and can barely wait to complete. Now though there is now a whole new raft of TV developments including the new DVB-T2 standard used by Freeview-HD, Project Canvas (Youview?) for Internet-TV and of course 3D. Murray explaining with the aid of a diagram. Murray explained why wideband ‘digital aerials’ and "mast head amplifiers" are the last thing you want when 4G-LTE comes to a street near you. He then went on and explained how there may be a further TV Switchover and digital dividend even before the current one is sold off. Meanwhile hard on the heels is Radio Switchover, recently enshrined in law by the Digital Economy Act and rapid developments by the Coalition, BBC and CEPT, but still not fully understood by public and others alike. This provoked a number of questions and comments from the audience - DAB Radio was not held in high regard by any of those who spoke. It appears that quality has been eliminated from the equation. Most DAB Radio sets now sold have at maximum a 8cm Speaker (more often half this size), often are Mono and hence the Radio Industry argument is that you cannot hear the lack of quality! Even BBC Radio 3 is compressed and restricted. This is a far cry from when DAB Radio was first launched with "higher quality than a CD" as its boast. The car radio is a major problem - very few cars have a DAB Radio set - most new cars now have the FM Radio built into the car in 2 pieces to prevent a thief taking a complete set away. A very expensive and needless excercise to replace a high quality FM system. There are at least 10 million FM sets in cars which with good traffic coverage work very well. He then made suggestions on how to avoid wasting money in the shops on kit that may become obsolete? Don't buy before Christmas as all the Retailers want to unload their old stock! Then only buy according to Murray's Law - see below! Click here for a 400kByte PDF file. The Slide on Page 6 contains the latest customer information. Thanks Murray for another top technical Presentation. July Meeting - "Constructors Competition for the M1FDE Shield"
Organised by Carl Thomson, G3PEM. On Tuesday 6th July the Chelmsford Amateur Radio Society (CARS) held its Annual Constructor's Competition. As last year the First Prize winner will be awarded the M1FDE Shield as well as a monetary award of £10. This trophy has been created in memory of Anthony Martin, M1FDE who passed away in 2008 at the age of 41. Anthony was a pioneer of the Personal Role Radio (PRR) introduced into the British Army in 2002, for which he was responsible for the RF design. Prior to its use the infantry could only communicate with each other via hand signals and shouting. The PRR is now seen regularly on TV news reports being used by UK and Allied forces in Iraq and Afghanistan. He devoted much of his spare time to Amateur Radio Training. 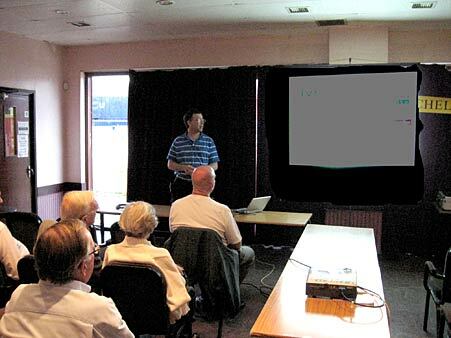 He taught every Thursday evening at the Foundation, Intermediate and Advanced courses run by the Chelmsford Amateur Radio Society in Danbury Village Hall. Over 5 years he helped more than a hundred new Amateurs get their licence. Anthony was keen to encourage home construction and he was always willing to help others with any problems they might encounter when making a project. Carl will issue judging sheets for the audience to mark the projects entered. There are very few Rules. Visitors are encouraged to demonstrate their handywork and maybe awarded the "Special Prize"
One can enter photographs or drawings if it is like a Power Station in size & difficult to bring. It should be electrically safe. CARS would like a small piece of paper with Name, Call-Sign & what the Entry is written on it. CARS awards real money - £10 for First, £7 for Second, £5	for Third and £5 for a "Special Award, typically a First Time Winners Award". Chairman John, G8DET introduced the Competition by showing the M1FDE Shield which will be presented at the AGM in October. Thanks to all who made the evening the success it was. Last revised:- 12th July to update the page.